Small scale aquaculture has had an exponential growth in our country, positioning itself as an important productive alternative for coastal communities and the activity of artisanal fishing. Its economic, social and environmental benefits are multiple, which, based on sustainable practices, allow us to improve income, jobs and contribute to food security. The ACCPA Project incorporates this vision with concrete actions. 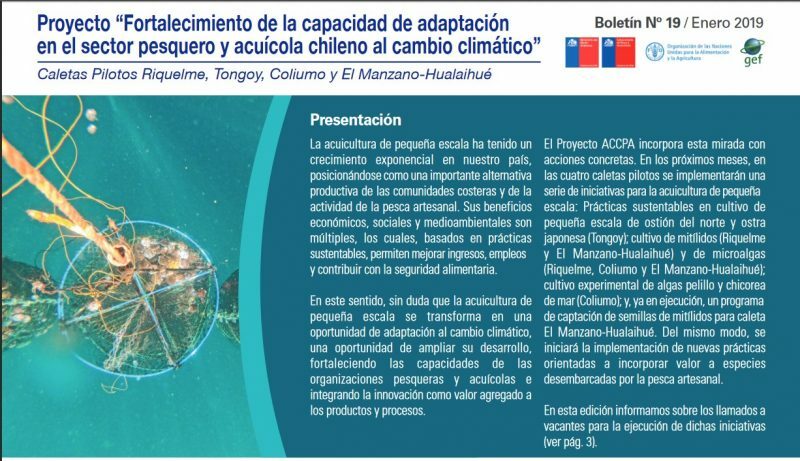 In the coming months, a series of initiatives for small-scale aquaculture will be implemented in the four pilot coves: Sustainable practices in small-scale culture of northern oyster and Japanese oyster (Tongoy); cultivation of mussels (Riquelme and El Manzano-Hualaihué) and microalgae (Riquelme, Coliumo and El Manzano-Hualaihué); experimental culture of seaweed pelillo and chicorea de mar (Coliumo); and, already in execution, a program to collect seeds of mussels for El Manzano-Hualaihué cove. In the same way, the implementation of new practices aimed at incorporating value to species landed by artisanal fisheries will begin. Con las primeras visitas a terreno para el levantamiento de información, se dio inicio al “Estudio sobre la utilización de la fauna acompañante por parte de los pescadores”. El estudio se realiza en las caletas Riquelme, Coliumo y El Manzano-Hualaihué, con el propósito de caracterizar la fauna acompañante en las capturas de cada caleta y proponer alternativas de uso para su aprovechamiento. With the first field visits to gather information, the “Study on the use of Bycatch by fishermen” was launched. The study is carried out in the Riquelme, Coliumo and El Manzano-Hualaihué coves, with the purpose of characterizing the Bycatch in the catches of each cove and proposing utilization alternative for its use.